Update Oct 3, 12:00 pm: In order to use 3D driving directions, you'll need to have the Google Earth plug-in installed on your computer. 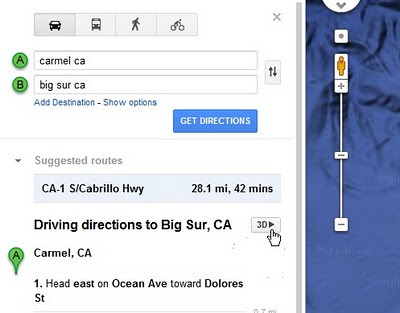 Getting directions is one of the most popular features on Google Maps, whether it be for driving, walking, biking or transit. Today, we are launching a new feature that allows you to bring your upcoming trip to life, by allowing you to preview your route in 3D. Let’s say you’re planning a road trip down the beautiful coast of California’s Highway 1 and want to be able to see what the route really looks like. California’s rugged coastline is not to be missed, but the top-down view really doesn’t give you a good sense of what this majestic terrain is like. Using the 3D preview; however, you can get aerial view of the route, as if you were in a helicopter flying above the road. To preview your own route, it is as simple as clicking on a button. 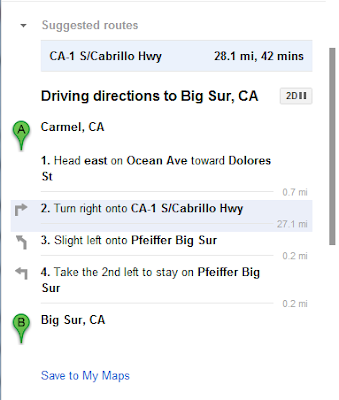 Start by entering your starting point, destination, and mode of transport like any directions; in this case, driving directions from ‘Carmel CA to Big Sur CA.’ Then, just click on the “3D” play button. The map will switch to Earth view and automatically start flying you along your recommended route. You can pause the flight at any time by clicking anywhere in the 3D view or on the pause button in the lower left. While the flight is paused, you can explore the surrounding area in 3D by clicking and dragging the map. When you are ready to resume the flight, simply click on the play button in the lower left of the 3D view. To help you keep track of which step you are on, the current leg of the trip is highlighted in the left panel. 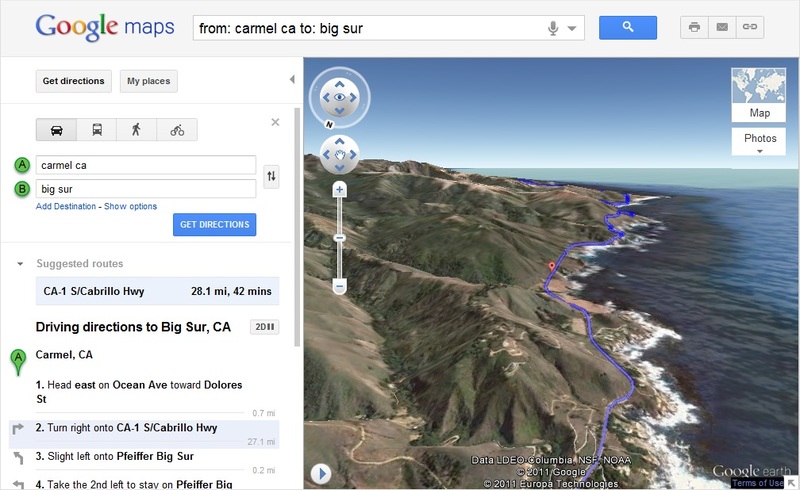 You can also jump to a different part of the trip by clicking on a different step. You can get back to 2D mode by clicking on the “2D” button in the left panel at any time. We hope you enjoy your flight.